You have to see these photos of a professional birth photographer taking on a different role during childbirth. Monet Moutrie has been involved in over a hundred births—after all, she is a professional birth photographer. But Moutrie took her turn on the other side of the camera this time: She was the one giving birth. 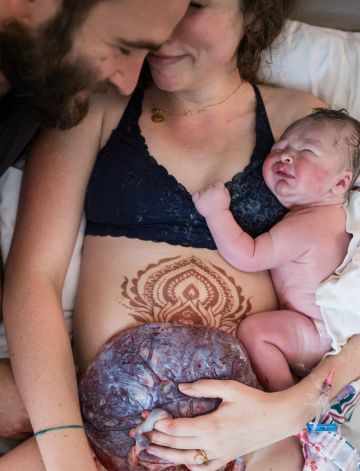 Naturally, she hired an equally talented birth photographer to capture the entire thing...and the results were incredible. Moutrie enlisted her friend, Jennifer Mason, a Denver-based photographer who specializes in shooting birth stories, maternity shots and breastfeeding sessions. Mason was on hand to capture Moutrie's natural birth, and the photos are a reflection of both women's passion for creating beautiful, memorable stories surrounding childbirth. "I knew from watching all the women I’ve worked with just how priceless and important those images are and so when I got pregnant, the first thing I did was talk to Jennifer….I know that I wanted her to be at the birth," Moutrie told Fit Pregnancy. The photos include intimate shots of Moutrie and her husband, Ryan, in the moments before she delivered. Photos of Moutrie holding her elder daughter during the calm before the proverbial storm. Closeups of the mother's henna-painted belly. And finally, shots of her youngest child making her way into the world. The photos feel raw and visceral and they really tell a story. This isn't the first time Moutrie and Mason have teamed up: The pair also founded Birth Becomes Her, a platform that aims to inspire expectant mothers and highlight the talents of fellow birth professionals. While Moutrie certainly knows what makes a beautiful birth shot, posing was the last thing on her mind during her own labor. Moutrie had a natural birth at a birth center (no epidural! ), and the experience left little room for thinking else anything else. "There were no options for any kind of pain relief, so I was very much in the throes of labor when Jennifer got to the birth center," she said. "I knew she was there—I could tell that she was in the birth center, but other than that I was really in the zone in terms of just working through contractions. All of my energy was wrapped up in just giving birth."